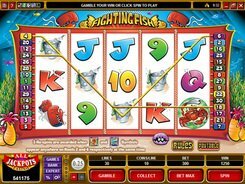 The five-reel Fighting Fish employs the symbols of a basket, boxing gloves, boxing ring and other sports-themed symbols with a humorous fish and underwater twist. You can bet 1 to 10 coins on each of the thirty lines, with a coin denomination of up to $0.25. The most sought-after combination is five Boxing Glove symbols that award a 5000-coin jackpot. The slot has two wilds with a typical substitute function – the Red and the Blue Fighting Fishes. They can display on reels 2 and 4, respectively. The Boxing Ring is a scatter that does not need to land on a specific payline to award you a decent cash prize. If two wild symbols occur on the reels simultaneously, you get three free games. You have to select the Blue or Red Fish before they fight. If the fish of your choice wins, the payouts earned during the free spins round will be doubled and added to your game balance when the bonus feature is over. PLAY FOR REAL MONEY!